In the 50th year since his assassination in 1968, much has and will be said about Martin Luther King Jr., the civil rights leader and icon whose legacy of nonviolent resistance inspired the world—while compelling some to distort and dilute his message of activism. But Coretta Scott King, the great woman consistently behind and beside the great man, was equally committed to the fight for civil rights. It was a fight she often waged with a quiet and graceful dignity, while simultaneously raising a family constantly under threat. And while she may not be considered the “Mother of the Freedom Movement”—a title typically assigned to Rosa Parks—Coretta was undoubtedly one of its primary muses, a living, breathing symbol of the steadfastness of the American black woman in defense of her family and the freedom of her race. Coretta Scott King was one of the most influential women leaders in our world. Prepared by her family, education, and personality for a life committed to social justice and peace, she entered the world stage in 1955 as wife of the Reverend Dr. Martin Luther King, Jr. and as a leading participant in the American Civil Rights Movement. Her remarkable partnership with Dr. King resulted not only in four children, who became dedicated to carrying forward their parent’s work, but also in a life devoted to the highest values of human dignity in service to social change. Mrs. King traveled throughout the world speaking out on behalf of racial and economic justice, women’s and children’s rights, gay and lesbian dignity, religious freedom, the needs of the poor and homeless, full-employment, health care, educational opportunities, nuclear disarmament and environmental justice. 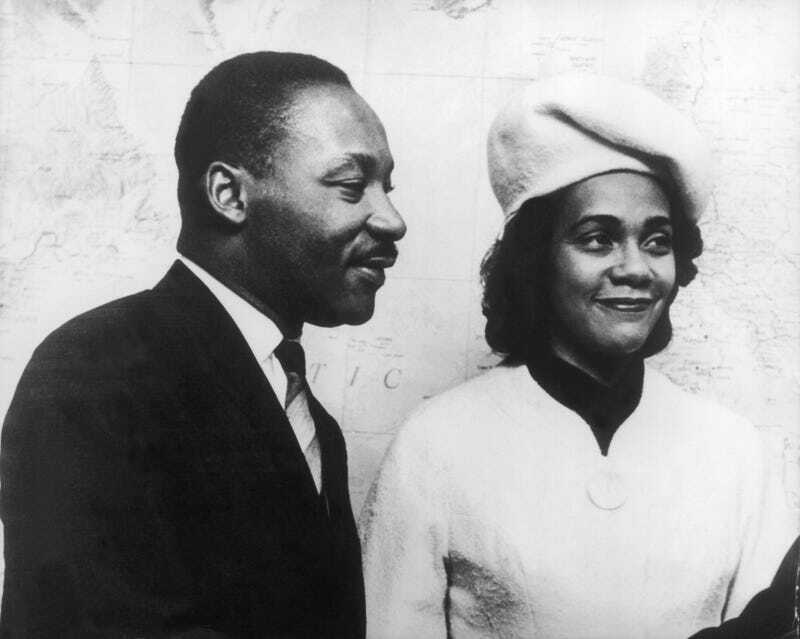 Far before her time, Coretta Scott King also embodied the rare work-life balance so many of us are still seeking, gracefully managing to mother her four children with Martin while consistently supporting, speaking and creating for the movement—including organizing the series of Freedom Concerts that functioned as vital fundraisers for the Southern Christian Leadership Conference. And she did it all in inimitable style. The Glow Up recently spoke with legendary costumer Ruth E. Carter, designer of the much anticipated Black Panther (more on that to come soon). Carter was also tasked with bringing Coretta—played by Carmen Ejogo—and the women of the 1965 Alabama voting rights marches back to life for Ava DuVernay’s 2014 film, Selma. She spoke highly of the icon who inspired her. At the time, Ejogo—who also played Coretta Scott King over a decade earlier in HBO’s Boycott—spoke with Screen Slam about receiving Coretta’s blessing when she originally took on the role, and their first meeting. After her husband’s murder in 1968, Coretta Scott King would remain tirelessly committed to continuing his work until her own death in 2006, ensuring that not just his legacy, but her own, remain with us as indelible examples of lifelong activism. Coretta’s place among the women of the freedom movement is one that will always be associated with dedication, grace, quiet brilliance—and, yes, style.